Why do 400g rugs seem the norm now? How many horses/ponies actually need them? I had a wake up call last year when my horse got laminitis for the first time. This winter I'm trying not to over rug, not giving as much haylage as previous (he will eat whatever I give him) and he was even muzzled when he changed fields over Xmas. Still?? That's shocking. They ought to know better. I think that people have no idea what a healthy weight looks like anymore. If they actually come across one, they think it’s too thin. I think back to my childhood at our farm and everything came out of winter a little bit ribby, it was totally expected and deemed perfectly normal. I nearly didn’t post a picture on Facebook this week. It was the girls in their field at the weekend, muzzled. The unclipped sports pony was unrugged. Reading it to a bit much perhaps, but that picture didn’t get anywhere near as many likes as a normal picture of my girls would. I hate muzzling them, but they’ve just moved onto a new field with an abundance of grass, they are both good doers, one isn’t in any work and we’ve not had normal winter temperatures to allow them to use up a bit more energy keeping warm. Our grass is so good that ideally I want mine to come out of winter on the slightly poorer side. It won’t happen, but that will remain my goal. 400g is ridiculous imo, especially with necks on. On my commute to work I pass many horses in different yards, all wearing necked or multiple rug layers stuck round a round bale-they nearly all look blinking miserable-and they were wearing these rugs when it was 7/8 degrees a few days ago, god only knows what they'll be wearing now its -3 (even though we have no wind and its glorious). I put this photo on this forum a while back as it has a naughty escaped lamb in the background. I was asked if the youngster was a rescue (starvation) case. *sigh* No, that's a healthy youngster. He had just had a growth spurt and yes, you can see ribs but look how well his hindquarters are covered (shoulders and neck well covered too but the mane makes it harder to see in the photo). The Vet was really happy with his condition. Found one from the same time, taken from the other side. He's on the left. I have just got amazed looks from the young member of staff at local feed store this morning, as I was picking up a 100g rug. She asked if I wanted 200 or more as it 'was really cold'. I declined, the pony will only wear the 100 a few times I suspect. Girl was aghast that pony has been wearing a rainsheet or as last night, a 40g rug. I explained pony was only actually in this to a, keep clean and b, help keep condition as was very poor, and is still not up to weight yet. I also explained that I was feeding according to condition and level of work. Apparently she has one native x, living out and not clipped, in 300g full neck and was going to up the rug tonight to 400g! Apparently he needs it...... I know the pony, it's a fat obese git! I declined her offers to find me necks to go with rug, and full neck rugs too. Another (older) customer agreed too about rugging these days....we both went off muttering about over rugging! I do have thicker rugs, but they won't be for this fuzzy, but are there for emergency as I didnt get rid when previous fuzzy but 1 went. I go to the feed merchants and see all the bags of and part of me wishes for a skinny minny every horse I ever buy ends up as a good doer what ever it’s like when it arrives . I have been restricting forage this winter and while one is perfect all the rest need to lose more even one is hunting on a restricted forage and a mug of balancer could lose a bit more . I do think a lot of people would think my ‘perfect ‘horse is a bit thin and my hunter who I would like thinner is ok because I think the norm for weight carried has definatly crept up over the years . Don’t know what the girl in the shop would think of Fatty he does not have a rug . I tell my girls on a daily basis that I wish they were hard to keep weight on. Honestly, I’d love to have a pair of skinnies, even if it cost me a fortune to feed them. I had a jumping pony in the 90s who really struggled to hold weight, thats the only horse I’ve had like that in all my years with them and I must say that plying a horse with feed and hay is so much easier than having to restrict them! Part of our problem here is that our grass is just too good. We don’t suffer from lack of grass in the winter and honestly, it’s a nightmare sometimes. similar here really, the move to wilts and discovering grass isn't all as full on as our low lying clay was pretty revealing! I think as long as magazines like Horse & Hound keep printing photos of obese winners at big national shows, and have columns written by show producers who ride this type of horse, sell advertising space to the feed companies who push all manner of feed/supplements/balancers and the rug companies with their latest designs, it is unlikely that the reality of the dangers of obesity in horses and ponies will be openly discussed. It's only a couple of years ago that a feed company owned and sponsored hugely fat young cob won a big class under a well known producer (widely covered by H&H) - and it died the following year. It would be interesting to know what happened to him. When a rider has to practically do the splits to ride a horse, and ends up looking like a Thelwell rider, you'd think a judge might notice how fat the horse is (and how ridiculous the overall picture looks). I Am gobsmacked that anyone thought he was a rescue . I found the old thread, here's the comment. 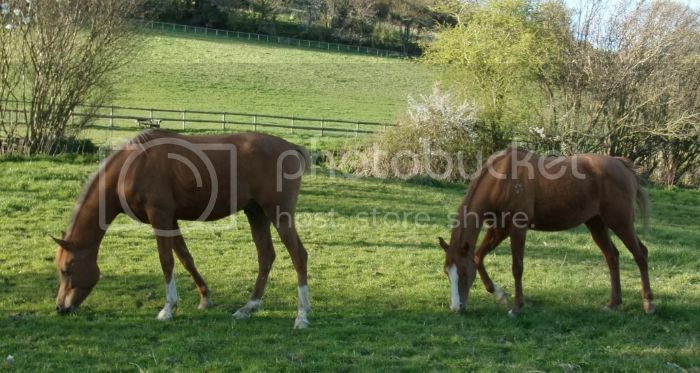 Only thing I can see wrong is the horse in the foreground looks very underweight. Is it a rescue case ? Over rugging is one of my pet hates! My mare is naked with a bib clip, gets a handful of pony nuts once a day and adlib hay overnight when in. She's still probably a bit on the podgy side although not massively so. I totally agree about the obese cobs/hunters that get front page coverage on Horse and Hound. Shocking! He died of colic. Whether that can be attributed to his gross obesity, I don't know. However, he certainly wasn't given the best chance of a long and healthy life carrying that amount of blubber just to fool the judges into thinking he was a maxicob. And there have been plenty more than this! Keep your horse simply. If it's not in work, let it grow a woolly coat & maintain itself. If it's in work that makes it too hot, clip accordingly & rug accordingly. Remember that fibre keeps your horse warm. They have an inbuilt furnace. 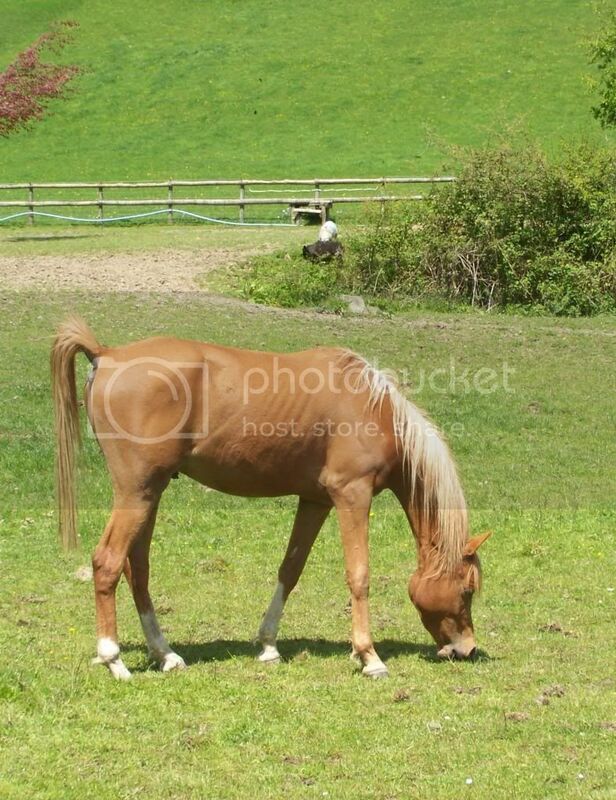 If your horse is fat, shorten its rations & stop babying it. They're harder than you think. & just because YOU need an extra 3 layers doesn't mean your pony does. He looks like a Belgian blue bull!! Awful,isn’t it just so wrong . I won’t open h and h on the showing pages because I am offended by the show horses ,hunters who would keel over if they where asked to actually hunt, hacks who look like balloons with cocktail sticks stuck on the bottom, and then you get to poor maxi cobs it’s just awful . I won’t have anything to do with showing and I don’t buy from companies who sponsor or use showing shots in their ads . I am regularly told my two are too thin as well. no such luck with the ponies despite my best efforts lol! Not always completely that straightforward as a for instance I have a horse on box rest he won’t see a field until late spring he will hopefully be able to do some light work soon on the roads when it’s dry . So atm he’s in 24/7 and is gaining wieght . I need to keep him calm and means he needs to eat forage .even we moderately restrict and we remove his rug during the day ( he’s clipped ) he still getting fatter . I don't understand how anything with a hind leg like that could win anything tbh. Poor horse though.